In this article we discuss why December and January are the ideal months for fruit tree pruning. Read on for fruit tree-pruning tips, including whom to contact for tree pruning services. We also discuss a common conundrum for fruit tree owners: What to do with extra fruit. 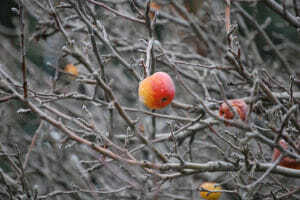 Why Prune Fruit Trees in the Winter? Annual pruning is important for all fruit trees. Winter is the best season for pruning fruit trees, because this is when they are dormant. During the cold months, the plant is in an inactive state, storing up energy for the following growth cycle. Energy gathered from summer sunlight is stored in the tree’s roots. At the end of the branches, new buds are starting to form for the next growth and fruiting cycle. Winter is well suited for training branches to grow into the shape of your choice; removing water sprouts (branches growing straight up); and eliminating crossed branches. DIY Fruit Tree Pruning Tips. You may have heard that tree trimming is best left to professionals. This is generally true, but as Portland tree pruning experts, we consider fruit tree pruning accessible for most homeowners. Safety First. Of course, you should always prioritize safety first when pruning. Working at height is rife with fall hazards. Assuming you’re following safety precautions, it’s empowering to learn how to properly prune and train your fruit trees. 1. Use the Right Tools. Of course, pruning requires a set of decent pruning shears, as well as a sharpening stone to keep the blade sharp. You may also want a quality pair of two-handed loppers (AKA brush cutters), and a pruning saw. Expect to pay between $100 and $250 in total for these three items. Additionally, you might need to purchase a pruning ladder to access upper branches. 2. Understand the Basics of Pruning. Hormones dictate plant growth, so understanding the flow and cycle of these hormones is paramount to understanding how your cuts will affect plant growth down the road. With experience, you’ll get a feel for the art and science of pruning, as you anticipate how the tree reacts to your cuts. This is the expertise that our certified arborists have spent decades honing. The basics, for beginners to keep in mind, follow. You’ll definitely want to prune away diseased and dying branches. Crossed limbs should also be removed. Next, cut away water sprouts and suckers, which grow near the base of the trunk, from the roots, or at the top of the tree. Finally, imagine throwing a cat through the tree. It may sound crazy, but this visual is a good rule of thumb to remember how much to prune away. You can also visualize where you want the tree to look like in five years, and remove branches that don’t fit that vision. Such pruning will help to open the center of the tree to improve air circulation and sunlight absorption. Proper Portland tree pruning is all about cutting into the branch in a purposeful way. Avoid cutting into the branch collar, a swollen, wrinkled area that forms where the branch and trunk meet. This is where the tree heals from a cut. To prevent heavy branches from breaking (and inviting disease) use three cuts: a) Place the blade about an inch above the branch collar on the underside of the branch you wish to remove. b) Cut all the way across the branch, cutting from the topside of the branch down, with the blade just beyond the first cut you made. c) Finally, cut away the nub, slicing off the section remaining above the branch collar. 3. Know your limits. Even with a good pruning ladder (the three-legged variety), pruning at the top of the ladder can be scary, risky, and downright dangerous. Don’t exceed your limits. If the situation feels unsafe, than it’s probably best to call a licensed and bonded professional who carries their own insurance. What to do with Extra Fruit. Excess fruit can be a hassle to deal with. If you simply cannot use or harvest all the fruit your tree produces, there is a solution: the Portland Fruit Tree Project. This inspirational non-profit group registers Portland nut and fruit trees, harvests their crops, and distributes the proceeds to those in need. We are happy to help the Portland Fruit Tree Project harvest thousands of pounds of fruits and nuts per year. The Portland Fruit Tree Project also hosts hands-on workshops to teach homeowners about tree care and preservation. How Urban Forest Pro can Help. We wish you the best of luck as you learn more about winter pruning and fruit tree care in general. If you have any questions, or would like a check up for your fruit trees, we would love to help. Contact us today to schedule a visit from a one of our certified arborists. Urban Forest Pro’s Holiday Gift to our Customers: Planting Trees!